While all service dogs hold a special place in the hearts of dog lovers, it is police dogs that reign supreme. The reason involves a combination of impeccable training and selfless effort while in the midst of potentially life-threatening danger. It is a reputation cultivated through movies and TV, yet seldom seen in real life. Cst. 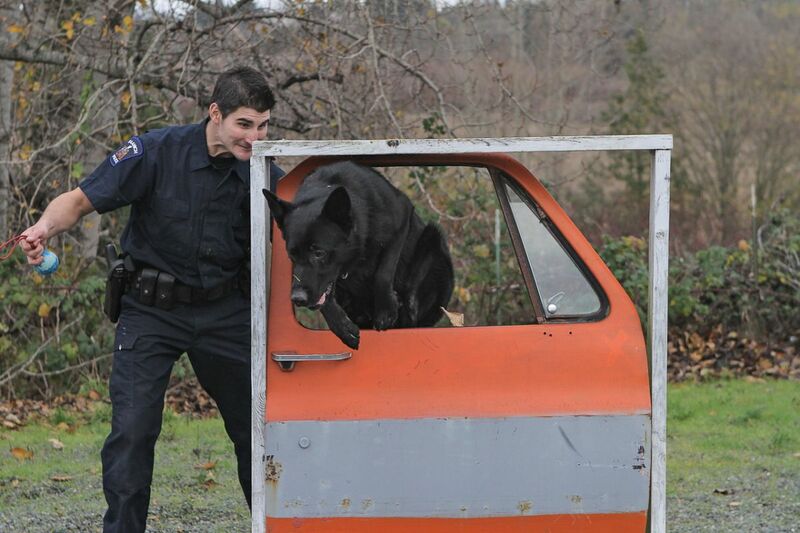 Jon Zielinski of the Saanich Police Department is partnered with a 5-year old German Shepherd named Zeke. 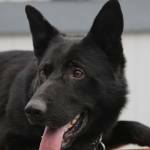 Born in West Germany, Zeke was originally purchased and imported to Canada by a well-known Shutzhund judge and competitor. Shutzhund is a long-established sport that tests the working ability of dogs, particularly in the traditional areas of tracking, obedience and protection. 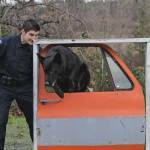 Fortunately for the Saanich Police Department, it was determined that Zeke was unsuitable for Shutzhund competition because of a minor flaw. As Jon describes it, “We were told that he had a strange bark, a high pitched bark.” Zeke was put up for sale and brokered through a well-known breeder and police officer located in Washington. It is only large police services such as the RCMP or major urban centres like Winnipeg, which maintain their own dog breeding programs. Small municipal forces, like those in Victoria, scramble to find suitable animals wherever they can be found. Zeke's less-than-direct route to service is not unusual, given the demand for police dogs in this post-9/11 era. 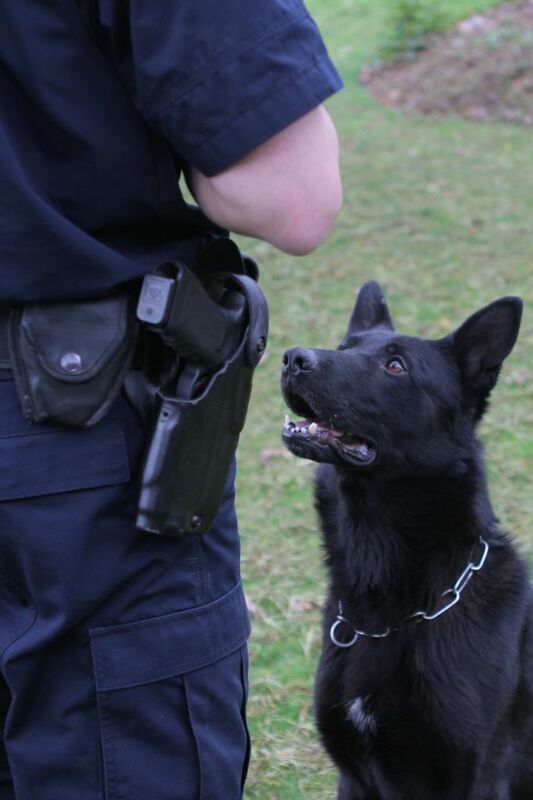 After initial testing, 18-month old Brasco vom deollenwiesestamm, as Zeke is officially known, was purchased by the Saanich Police Department and assigned to Jon. Being a member of the K9 unit in a small municipal force is considered a plum posting in police work. For that reason, police officers are rotated through the unit in order to maintain motivation within the force. Applicants to the K9 unit need not have an extensive background with dogs, but must have a love of animals, good policing skills, sound judgment, an ability to work independently and be physically fit. The officers will be taught how to train and work with their dog. 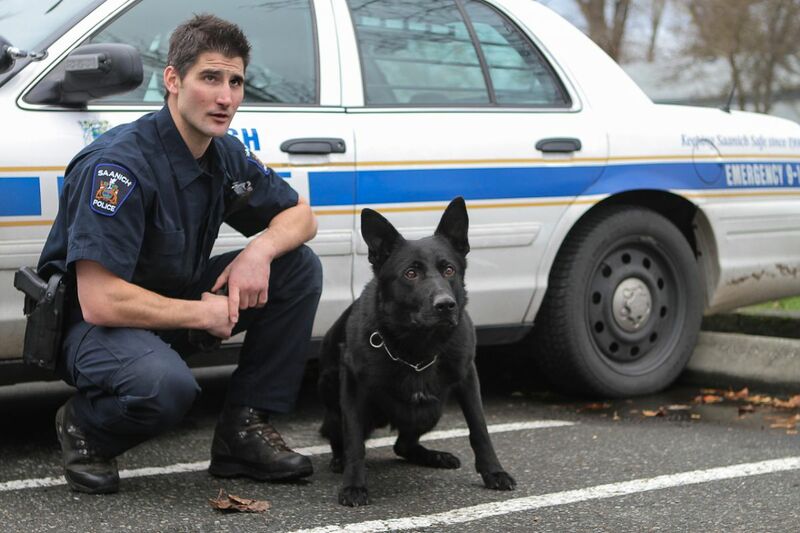 In Saanich, an officer's tenure in the K9 unit is linked to the working life of the dog. Once an officer and his dog have completed 5 years in the job, the position is grandfathered. 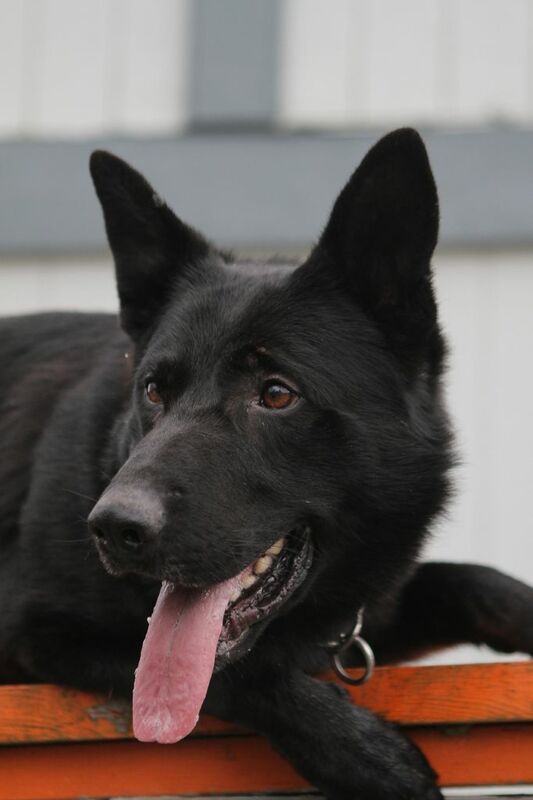 This means the police officer and dog will continue to work within the K9 unit, but the officer's posting within the unit will cease when the dog is physically unable to continue with its duties and retires. Zeke is Jon's third police dog. Jon's first dog Bauer, was found to have an unsuitable temperament early in his working life and retired to a farm where he still lives. Titan, his second dog, died -- not from his police work - but from a natural health issue before serving his five years. As a result of these difficulties, Jon's posting within the K9 unit has exceeded the norm. Given the disappointments associated with Bauer and Titan, Jon felt there was something unlucky in using hockey-based names. When renaming Brasco, Jon decided to honour his father whose nickname at work during his 35 years with the RCMP was Zeke. Typically, police dogs are about 15 to 18 months old when they begin training since “They must be mature enough to handle the training both mentally and physically, as they are put in stressful situations.” According to Jon, “Confidence, a desire to please their handler, high drives, easy motivation and a willingness to work” are necessary characteristics for a good police dog. The training is intense. The days are hard and long -- 10 to 12 hours -- and it goes on for 3 to 4 months before they reach a level where they can certify. During this time, the officer is removed from active duty. This is also a one-on-one bonding time when the police officer becomes the centre of the dog's existence. Police dogs are allowed everywhere, with no restrictions to their access. Therefore the dogs must be comfortable in all situations so they can focus on their work and not their surroundings. Initially the dogs are exposed to some basics such as arenas where sounds echo, slippery floors or open staircases. New variables are constantly added and they learn to ignore loud noises, track suspects out-of-doors over various terrains and obstacles and ignore all commands but those given by their handler. They also learn to bring suspects under control. In Zeke's case, he is also cross-trained to find drugs. 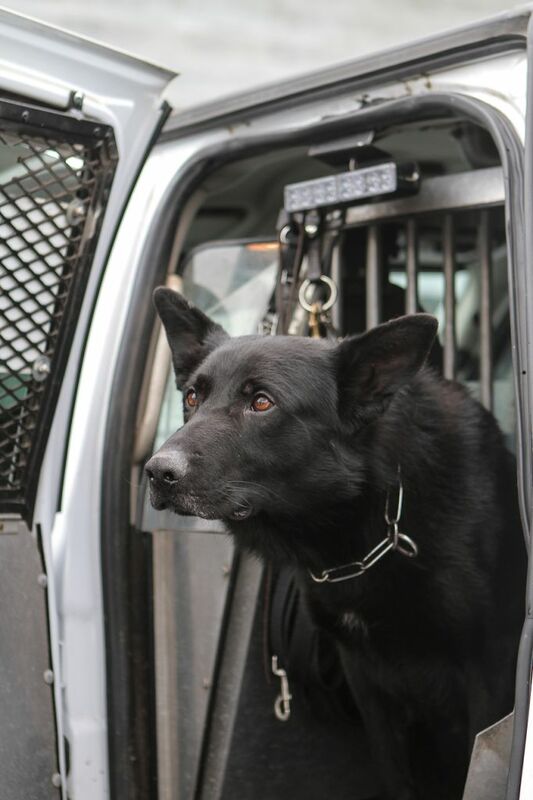 Saanich's four K9 teams are on call 24/7, with most of their 10-hour shifts scheduled at night, as this is when the types of crime occur that most benefit from the assistance of the K9 units. The typical overnight routine for Jon and Zeke - in the absence of a K9 unit call -- involves two separate sessions of fieldwork where Jon practices to maintain Zeke's skills. Jon particularly focuses on tracking, as this is the skill most commonly required but he will also practice Zeke's evidence work, drug searches, building searches, obedience, criminal protection and bite work. In between sessions, Jon will attend the shift briefing, and, if the call is of short duration, go on routine police calls. He must, however, be able to extricate himself from the call, if he receives a K9 unit request. On quiet nights, Jon and Zeke can often be found patrolling neighbourhoods. Working the K9 unit is prestigious, but also taxing. It isn't just the fact that the team is on-call 24/7, but the impact it has on the officer's private life. 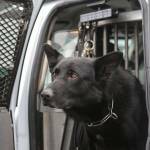 The police dog is housed in the officer's residence, in a large kennel structure supplied by Saanich. The emphasis on overnight shifts is a burden to routine family life. And, when called to duty, tracking is exhausting work for both police officer and dog. When tracking and chasing a suspect, the police officer is always following behind holding a 20- or 30- or even 50-foot tracking lead. As Jon says, “They're dragging us along, it's almost like water skiing. It's all you can do to hold on.” Tracking suspects can take hours and when running non-stop through our rugged, forested terrain, it tests the limits of physical fitness for both dog and officer. Jon's biggest surprise in working with the K9 unit is how humbling the experience can be. When responding to a critical situation, Jon places enormous trust in Zeke. Their communication is good but limited, as they can't discuss possible options with each other like human partners would. There is a favorite K9 unit phrase “The dog has no reason to lie to you” that Jon always tries to keep in mind. When a pursuit or search is not successful, Jon works through his disappointment by reviewing the incident from all angles trying to identify improvements that could have resulted in success. One of the rarely recognized benefits of having a K9 team responding to a call is the measure of calm the dog's capabilities can bring to a situation. Their presence alone boosts the confidence of other police officers at the scene. When out alone at night, Zeke will warn of potential threats before Jon is even aware of them. Subtle, but welcome benefits. When Zeke is on duty, he doesn't wear his police K9 identification harness. It isn't necessary, as Jon in his uniform provides that information and Zeke is always with him. Besides, according to Jon, “Zeke has a bit of a mischievous side to him”, and he would chew the harness. When on duty and not training or answering a call, Zeke waits for Jon in a specially equipped, unmarked police SUV. During the summer, the vehicle is air-conditioned at all times and should that fail, Jon has an alarm that notifies him of that fact. Zeke is rarely brought into the police station, and if he is, it is only for short periods of time. For Zeke, his contact with other people and animals is limited and only conducted under controlled conditions. At home, Zeke lives in his special kennel, where he knows he is off-duty. In this “safe space” as Jon calls it, Zeke ignores the world around him whether it is the doorbell ringing or people walking up the driveway. He is not allowed in the house as he is not a pet. The day Zeke retires from active duty is the day he will move into Jon's house. Not every police dog has the ability to put away its work persona when off-duty, but Zeke has that “off switch” as Jon calls it. When at home, Zeke's playful, mischievous side emerges. He's very social with other animals and people. He and Jon's Labrador Retriever Hazel are buddies although, as Hazel is getting older, she doesn't want to play quite as much. Jon has no hesitation about letting Zeke interact with his young son. When the family goes on vacation, Zeke is there. He particularly enjoys chasing his ball and diving off the dock at their Lake Cowichan property. Jon can often be found on his days off walking the two dogs on-leash in populated areas or off-leash in remote locations where Jon feels there is little likelihood of running into other people or animals. For Zeke, every day is an adventure and his enthusiasm is clearly visible. It doesn't matter to Zeke whether he is just going out for a training exercise, being called to duty or off on a family outing; he is just happy to be with Jon. Meeting Zeke is an experience. The overwhelming impression is one of focus. He constantly looks to Jon for direction, or when something catches his attention - like his favorite ball - nothing can distract him, except Jon's direction. 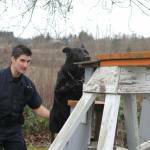 Zeke's career as a Schutzhund competitor may not have been successful, but Schutzhund's loss is Saanich's gain. Not only did Zeke outgrow that high-pitched bark, but now he and Jon have the distinction of being the 2012 Canadian Police Canine Overall Champions. Out of 40 teams, they scored 1st in tracking, 1st in building searches, 5th in criminal apprehension and an unheard of perfect score in obedience. No doubt Zeke's skills contributed greatly but, ultimately, Jon feels the win was attributable to Zeke's ability to focus. 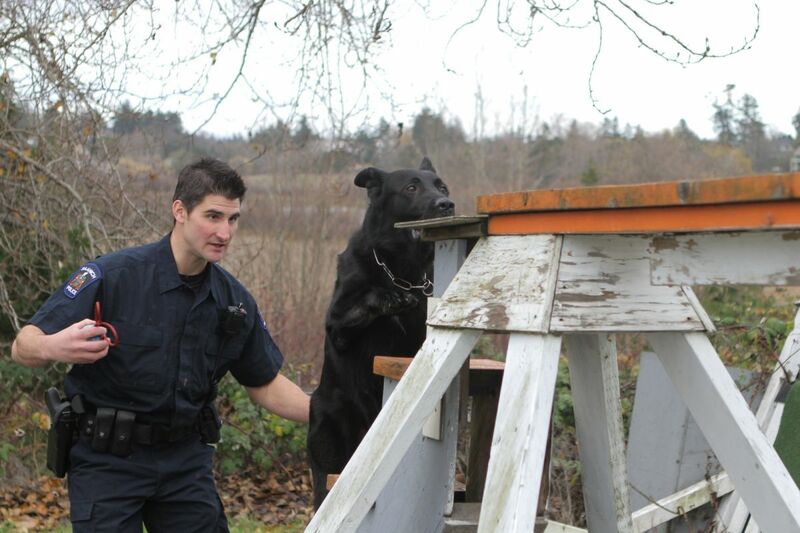 In 2013, Saanich Police will be hosting the Canadian Police Canine Championships here in Victoria. The competition will run September 18 - 22, with the last day of competition open and free to the public. This will provide a rare opportunity for members of the community to see these magnificent animals demonstrate their talents. Mark your calendar. 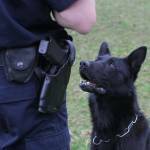 Editor´s Note: What happens when a police dog retires? Next issue, we talk with Sue McLeod of the Victoria Police Force about retiring her dog, Pago.